Our admiration for celebrity airport style has been well documented; however, today we're turning our attention toward perhaps the most valuable travel accessory: luggage! Upon further investigation, it appears practically every fashionable celeb has a Rimowa suitcase in tow. The brand (born in the late 19th century) is recognisable for its signature grooves and sleek design. Scroll down to see ladies like Rosie Huntington-Whiteley and Cara Delevingne towing their Rimowa around the airport, and shop our luggage picks at the end! On Fanning: Alexa Chung for AG Jeans dress; Prada sandals; Rimowa suitcase. On Delevingne: Topshop jacket; H&M pants; Minna Parika sneakers; Rimowa suitcase. On Stewart: Sonic Youth sweatshirt; Vans sneakers; Rimowa suitcase. On Williams: Prism espadrilles; Rimowa suitcase. On Kurkova: Converse sneakers; Rimowa suitcase. On Ambrosio: Illesteva sunglasses; Minnie Rose tee; L'Agence jeans; Birkenstock sandals; Rimowa suitcase. On Upton: Frame Denim jeans; Bottega Veneta bag; Rimowa suitcase. On Paltrow: Saint Laurent sweater; 3x1 jeans; Chanel bag and boots; Rimowa suitcase. On Moretz: Barton sunglasses; Black Orchid jeans; Nike sneakers; Rimowa suitcase. On Bosworth: Prada loafers; Rimowa suitcase. 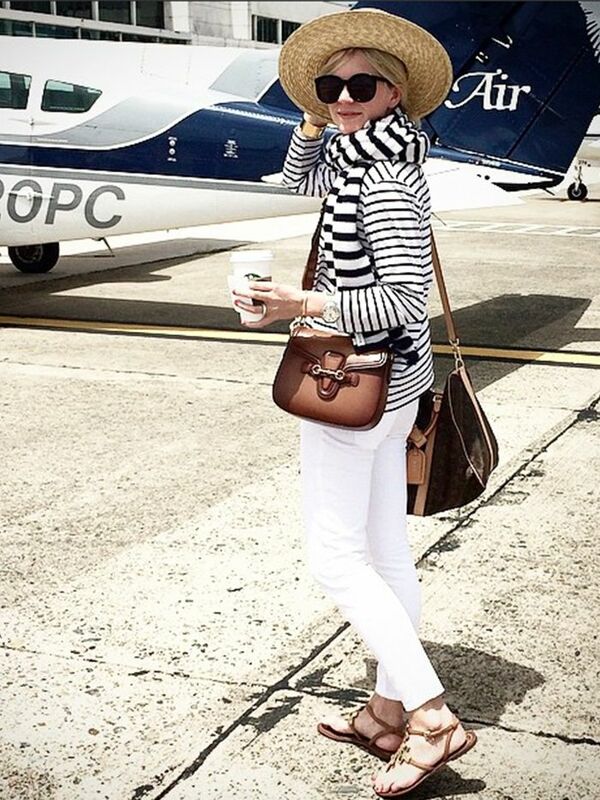 On Huntington-Whiteley: Maison Michel hat; Barbara Bui coat; Chloé top; Isabel Marant sneakers; Rimowa suitcase. Keep going to shop our Rimowa picks as well as budget-friendly luggage pieces!